This was 1998 all over again: Mika Hakkinen versus Michael Schumacher. But then the German broke a leg and Hakkinen faced a new challenge from Eddie Irvine, one that raged all the way to the final round in Japan. Little had changed for 1999, as McLaren and Ferrari had retained their driver line-ups and design teams. All cars had to race on tyres with an extra groove in them, but this failed to shuffle the order, with Jordan, Williams and Benetton still fighting to be best of the rest, and Arrows and Minardi fighting not to be last. The major novelty was the arrival of a new team: BAR. Jacques Villeneuve had moved from Williams to join his friend Craig Pollock, with Ricardo Zonta in the number two seat. McLaren filled the front row at Melbourne, with Hakkinen 1.3s clear of Schumacher's best. Fortunately for Ferrari and the others, the new McLaren was fragile and both retired. Schumacher wasn't to benefit, as he'd failed to get away on the parade lap before the second start - the first having been aborted after both Stewarts caught fire - and had to start from the rear. And so team-mate Eddie Irvine came away with his first win, followed home by Jordan newboy Heinz-Harald Frentzen and the driver with whom he'd changed places, Ralf Schumacher, now of Williams. Hakkinen overcame a gearbox problem to overhaul Schumacher for victory at Interlagos. Rubens Barrichello led in front of his home-town fans when Hakkinen slowed without gears. He was on a two-stop strategy, the others planning to stop just once, but it showed how the Stewart team was making progress. However, his engine failed, leaving Frentzen to finish on the podium for the second straight race. It was an all-McLaren front row at Imola, but the Ferraris were right with them. This pressure paid in the race, when Hakkinen pressed too hard in his attempts to build up a lead, running over the kerbs out of the Traguardo chicane and clouting the wall. The crowd became even more excited when Schumacher outran David Coulthard to win. Ferrari's improving form was emphasised when Ferrari finished first and second at Monaco. Lest Ferrari think they had taken the upper hand, McLaren meted out its traditional one-two in Spain, but with Schumacher just 11s down on Hakkinen in third after he'd been delayed by a fast-starting Villeneuve until his first pitstop. Still, though, BAR sought its first point. If Hakkinen had slipped at Imola, then Schumacher did likewise at Montreal, sticking his Ferrari into the wall when leading. Hakkinen took maximum points, while Coulthard came away with nothing after tangling with Irvine when fighting for third. The best race of the year came at Magny-Cours, with five drivers leading the race as rain affected play. At the end, it was Frentzen in front thanks to a clever refuelling tactic when the team put in sufficient fuel to see him through to the end. Hakkinen, who was ahead in the closing stages, had to pit for a second time with seven laps remaining. He thus fell to second, ahead of Barrichello who'd started on pole after a quick lap before the skies opened in qualifying and led for half of the race. With Schumacher only fifth behind his brother, Hakkinen was now eight points to the good. The title battle was to change at Silverstone as Schumacher crashed on the first lap and broke his right leg. Hakkinen was unable to benefit as a wheel fell off his car and Coulthard came through to win from Irvine. However, Coulthard tipped Hakkinen into a spin on the first lap at the A1-Ring. Although Hakkinen fought back from last to third, he had every reason to be unhappy. To make matters worse, Coulthard had been outpaced by Irvine who was now just two points down on Hakkinen. This became even more of a nightmare for Hakkinen at Hockenheim when he lost the lead when there was a problem with his refuelling rig. On rejoining in fourth, his fightback came to an end when he had a blow-out and crashed coming into the stadium. Again Irvine won, this time courtesy of Schumacher's stand-in Mika Salo letting him through. McLaren stopped the red tide in Hungary with a Hakkinen-Coulthard one-two. Still two points behind Irvine going to Spa, Hakkinen didn't enjoy the Ulsterman's advantage of having number one treatment, as McLaren boss Ron Dennis refused to ask Coulthard to be subservient. And this showed when the pair touched at the first corner. Coulthard emerged ahead and stayed ahead, with Frentzen keeping Irvine back in fourth. The pressure was on at Monza and again Hakkinen cracked when leading, spinning out. Fortunately for him, Irvine was able only to finish sixth and thus they were level on points with three rounds to go. For the record, Frentzen drove a great race to win at Monza with Ralf Schumacher second ahead of Salo to give Williams its best result since 1997. Even Ralf's team-mate Alessandro Zanardi ran third before his wretched comeback season after winning two Indycar crowns was hit by a detached undertray and he slipped back to seventh. Rain shuffled the order at the European GP at the Nurburgring. Frentzen had been set for victory, but his electrics failed. This left Coulthard in front, but he spun off, as did Fisichella. So Ralf Schumacher led, but a puncture cost him time and Johnny Herbert profited, thanks to staying on dry tyres in the changing conditions. With Barrichello finishing third behind Jarno Trulli's Prost, team boss Jackie Stewart had every reason to be delighted. His team had proved itself to be a winning outfit before being handed over to new owners Jaguar. Hakkinen finished fifth, with Irvine missing out with a run to seventh not helped when his pitcrew lost a tyre at a pitstop. Minardi's Marc Gene split the two on a day that saw team-mate Luca Badoer lose fourth place when his gearbox failed. There had been talk of Schumacher being ready to return at the Belgian GP, but he didn't fancy assisting Irvine to become the first Ferrari driver since 1979 to be World Champion. So he delayed his comeback until F1's first visit to Malaysia. And there he dutifully held back Hakkinen so that Irvine could win the first race at Sepang. 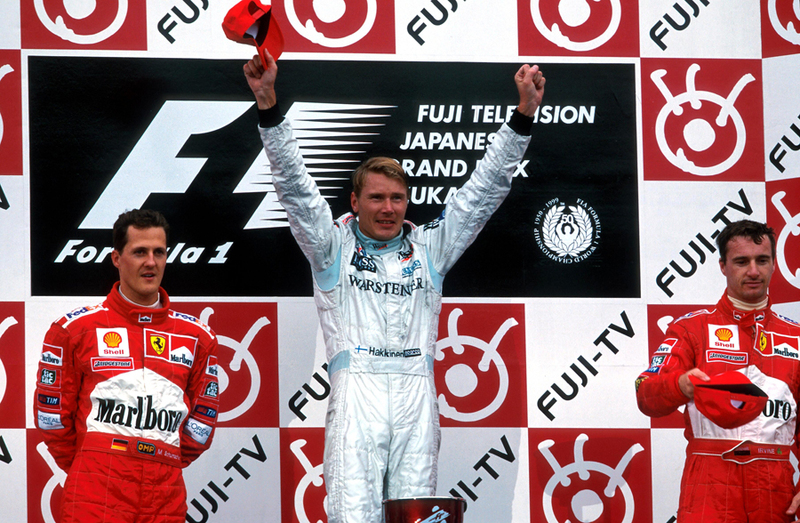 Arriving at Suzuka with a four-point deficit, Hakkinen knew that the best way of claiming his second title on the trot was to win. And this he did, leading all the way from Schumacher, with Irvine a distant third. Even if Irvine had been let through to second and ended the year equal on points, Hakkinen would have taken the title by having five wins to Irvine's four.